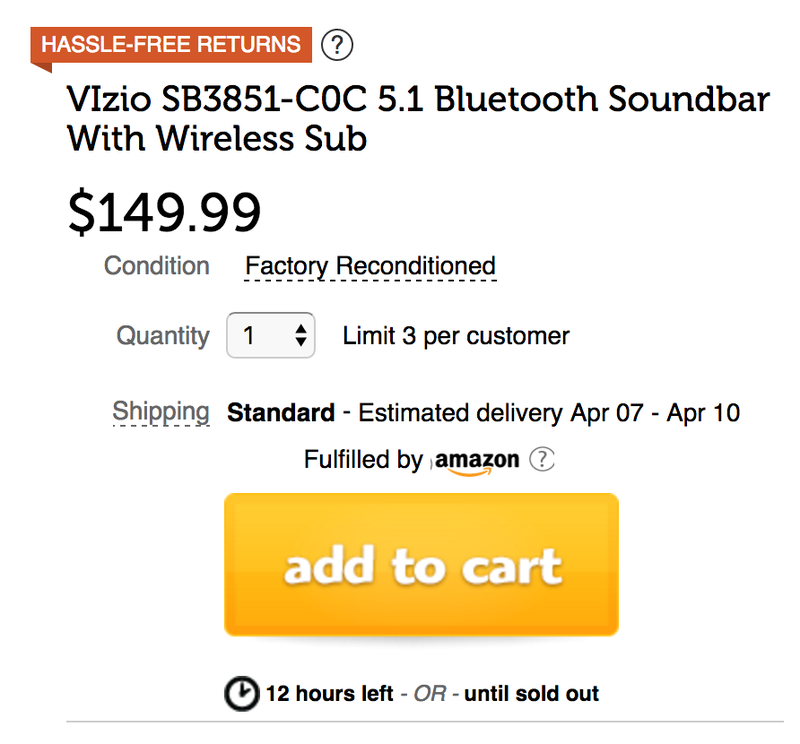 Woot offers the factory refurbished VIZIO SB3851-C0C 5.1-Ch. Bluetooth Soundbar with Wireless Subwoofer for $149.99 + $5 flate rate shipping. For comparison, it has a list price of $250 which it fetches in new condition at Target. Today’s deal is $45 less than the Amazon all-time low on a refurbished model. Rated 4.3/5 stars by over 860 Amazon customers. This Certified product is tested and certified to look and work like new. The process includes functionality testing, basic cleaning, inspection, and repackaging. The product ships with all relevant accessories, a 90-day warranty and may arrive in a generic box. Surround yourself with amazing sound with VIZIO’s all-new 38″ 5.1 Sound Bar System, a great fit for 42″+ Class TVs. The addition of the rear satellite speakers and deep-thumping wireless subwoofer create a true 5.1 surround sound experience, immersing you in the middle of the action. The built-in Bluetooth feature allows you to wirelessly stream music from any Bluetooth enabled device, even when the TV is off. An Intuitive LCD display remote makes it easy to change audio settings from the palm of your hand. With everything you need for a quick and easy setup, upgrading your TV audio to a home theater experience has never been easier.